Recently, I had the opportunity to travel to NYC for an extended weekend of sightseeing, visiting friends and family, and eating way too much fantastic food. These activities alone would have filled a calendar and required prioritizing. But, being a runner, I couldn’t resist looking at running routes from the hotel and scouring the internet for a possible race. Could I find an event to sign up for that fit in the schedule and was a manageable distance considering my fitness??? Then I found the perfect event to sign up for. 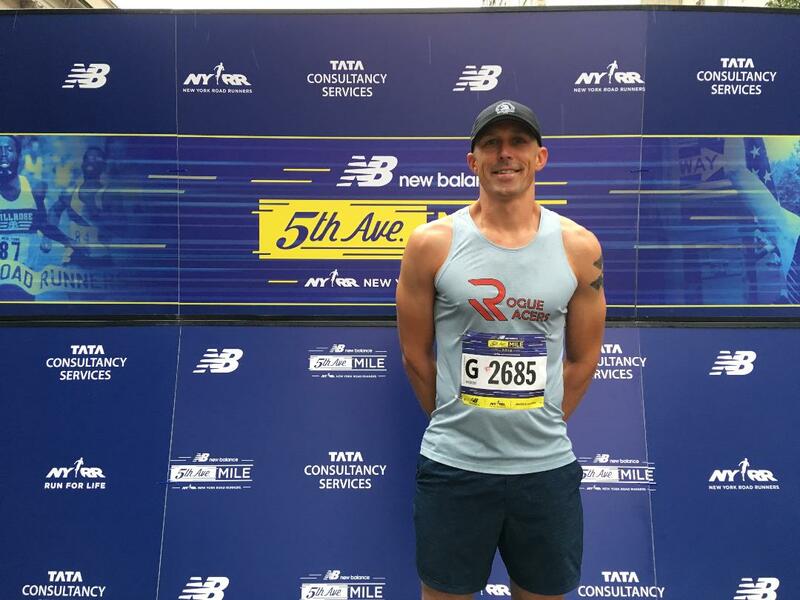 The New York Road Runners were hosting the New Balance 5th Avenue Mile on Sunday, September 9th. They would be sending thousands of runners speeding down 5th Avenue along Central Park beginning at 7:25 AM. The waves would start 15 minutes after each other with the professional elites going last at 12PM. I was excited that I could easily get to the starting corals, run the race, and shower before my return flight to Columbus. The event was extremely well organized. Great email communication, easy packet pick-up at the NYRR RUNCENTER, a host of volunteers in the starting area to give directions and plenty of port-a-potties all contributed to the event’s success. In regards to the race, I had only one road mile race under my belt previously. As my wave launched, I found myself 8-10 wide with other runners as we hustled down 5th Avenue. I had no idea what pace we were running as the crowd screamed in support. I merely focused on not tripping while wondering if my lungs were going to get any oxygen in them. Then the finish line appeared like magic. I was beaming from the joy the experience provided. If you ever have the chance to run in this race, I would highly recommend it. New York has a fantastic running scene and the 5thAvenue Mile is a great way to get a sense of what the running community is all about.